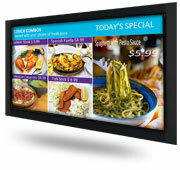 Digital Menu Boards are quickly becoming necessary in hospitality spaces. Our system is a refined commercial grade system that can support one to 4 screens in single or mixed aspect. Ideal for Retail, Restaurants, Cafeterias, Fast Food, Movie Theaters and more. Powered by the Gallery 2000.